I’ve spent so much time the past few weeks worrying about school and at-home lunch ideas. As I’m sure I’ve mentioned, part of my biggest problem is burn-out. Like anyone, the kids get tired of eating the same lunch over and over again. My husband and I get tired of eating the same thing too. But when it comes right down to it, we eat whatever is on hand, even though that sometimes means we have peanut butter and jelly sandwiches three days in a row. If anything, it’s easier than packing everyone up and running out to pick up something or make a quick run to the grocery store. However, I can’t imagine the temptation faced when working outside of the home. Knowing myself, I would absolutely be running out to grab a fast food lunch (or Chinese take-out) at least a few days a week. So I definitely understand this email I received from a reader the other day. I have seen many blogs including yours talk about school lunch options, but I haven’t seen many for adults. I get bored with taking my lunch so I end up buying something which is not very frugal of me. So I would love to see a series about brown bag lunches for adults. Or if you know any food bloggers who have already done something, can you please point me in the right direction? 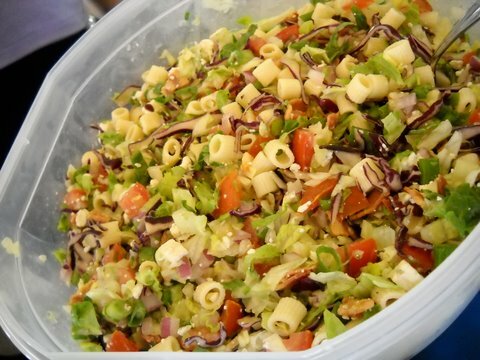 Homemade Portillos Chopped Salad would make a great lunch, but I’d definitely leave the dressing on the side and toss just before eating. 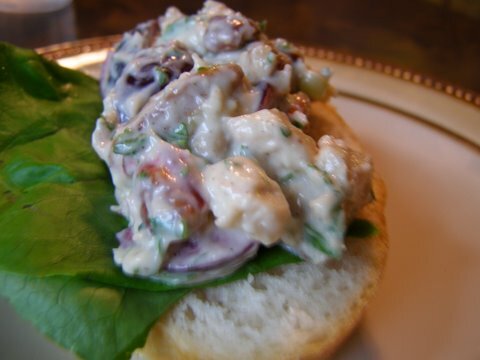 Assuming refrigerator access, Cherry Pecan Chicken Salad would make an awesome lunch served by itself, with crackers or as a sandwich. Sure they’re a breakfast time favorite, but Bacon and Cheese Muffins often make a welcome appearance on our lunch table. Since they’re so portable, they’d definitely be a great brown bag option. Stuffed Breadsticks taste just a good at room temperature as they do right out of the oven, making them an ideal brown bag option. I’ve always been a fan of lunches that center around soup in a thermos. Mini Meatball & Arugula Soup would definitely take that childhood favorite to an adult level. Now it’s your turn! I know I’d love your input and ideas and I’m sure Stephanie would as well. What are some good brown bag lunch ideas for adults? Tips, ideas, recipes and links are all appreciated! I’ll pull all of your suggestions together and do a round-up post of them later this week. Thanks in advance! Good question! My husband likes to take fruit salad – apples, oranges, blueberries and walnuts with honey drizzled over top. During the winter he’ll grab a can of soup, usually Beef and Barley or Italian wedding soup. When we’ve gone through our current stash of Progress, his favorite, I’ll start making homemade soup for him. The options depend not just on what’s available at work for reheating and storage, but also on the type of job. On the days when my husband, an engineer, is on a job site, he only takes the fruit salad. When he’s in the office, he’ll also grab the soup. I think my husband would love the cheese and bacon muffins. I’m going to make a batch for him this week! This is an easy one, look up bento lunches! Most websites I’ve seen on the ‘net focus on fancy/cute bento for kids, but there are some out there for adults too. I pack Hubby and I bento lunches a couple of days a week to keep us from going out and buying stuff. Though you will see a lot of Japanese recipes, ‘typical American food’ works just as well. It really isn’t as complicated as it looks! Last fall I did a college internship where I worked in an office most days of the week. I always packed my lunch and I ate a lot of PB&J! However, once I learned I had access to the break room fridge, I started being creative. Two of my favorite lunches were sliced cheese, whole grain crackers, and a piece of fruit; and fried rice heated in the microwave with a side of sliced vegetables. I would make fried rice for dinner with brown rice, scrambled eggs, chopped carrots, onion, cabbage, ginger, and soy sauce. The leftovers were great to take to work the next day. Hi Kate! These ideas look AMAZING. In fact, I’m going to feature them on my blog today…my hubby is ALWAYS whining about lunch ideas so this is perfect. Thanks! we generally do leftovers for lunch…my husband complained once that he was tired of sandwiches. I told him he was welcome to pack his own lunch! now we try so many new foods that i plan leftovers for us! I’m so glad you asked this question! I’m equally interested in everyones answers. Building menus is so much easier when you know what people like to eat! I am in need of ideas for brown bag lunches also…My hubby is a truck driver, doing runs from Seattle and Portland ports….sometimes he eats his lunch while waiting for loading and unloading. So he needs food that is easy to grab…Please give more ideas…. I’m a freezer cook like Tricia, and years ago when I started, I used the 30 Day Gourmet recipes and planning worksheets. They are great. I’ve made a bunch and loved almost all. They also have an e-book called Lunches on the Go. Check out some sample recipes and the table of contents. Keep these great ideas coming!! We are in a serious budget crunch these next few months and there is no room for error. So bringing my lunch to work is a must. I would most definitely enjoy more brown bag adult lunch ideas also. My husband takes his lunch everyday. He works construction & sometimes has access to a microwave & refrigerator & sometimes not. He has a small cooler to take to keep things cool in the summer. In the winter, he often takes soup (either in a thermos or in a container to heat if it’s homemade or can (if it’s purchased). Sometimes he takes leftovers–pizza, casseroles, etc. Things easily reheated. Another favorite is taco salad. I put lettuce in a large gladware & then in separate baggies pack shredded cheddar cheese, tortilla chips, taco meat, salsa or catalina salad dressing & sometimes tomatoes. He adds on the toppings when he’s ready to eat. These are great ideas–I still need to make the portillo’s copycat salad! I love leftovers for lunches. I am tooo cheap to buy my lunch more than once a month so I always take leftovers if we have them. Or make a salad if we do not.